Tell whether the ordered pair is a solution of 3x - 4y > 9. 3x - 4y > 9 Write inequality. 3( 2 ) - 4( 0 ) 9 Substitute 2 for x and 0 for y. 6 > 9 x Simplify. (2, 0) is not a solution of 3x - 4y > 9. 3x - 4y > 9 Write inequality. 3( 2 ) - 4( -1 ) 9 Substitute 2 for x and -1 for y. 10 > 9 ✓ Simplify. (2, -1) is a solution of 3x - 4y > 9. Step 1 Graph the boundary line. Use a dashed line for < or >, and use a solid line for ≤or ≥. Step 2 Test a point not on the boundary line by checking whether the ordered pair is a solution of the inequality. Step 3 Shade the half-plane containing the point if the ordered pair is a solution of the inequality. Shade the other half-plane if the ordered pair is not a solution. Step 1 Graph the equation . 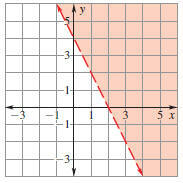 The inequality is <, so use a dashed line. Step 2 Test (0, 0) in . Step 3 Shade the half-plane that contains (0, 0) because (0, 0) is a solution of the inequality. 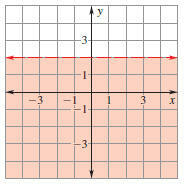 Graph the inequality x ≥ 4. Step 1 Graph the equation x 5 4. 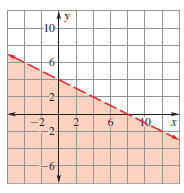 The inequality is ≥, so use a solid line. Step 3 Shade the half-plane that does not contain (0, 3), because (0, 3) is not a solution of the inequality. Guided Practice Graph the inequality.